We called from Greece to reserve a room at a familiar hotel at our port city of Ancona, Italy specifically to receive a packet of biking maps from our young Italian friend, Alberto. And it felt like a mini-homecoming as we walked through the hotel door and the clerks said “Yes, we remember you.” (We chose to believe it was our distinctiveness as middle-aged Americans on bicycles and nothing more unflattering.) And picking up our piece of snail-mail stuffed with glossy bike info from Alberto added to that “at home” feeling. It was nice to plop down in a familiar room in a familiar town as we made the normally shocky transition between 2 very different countries after the almost 24 hour ferry ride. We flipped on the Italian-only TV and immediately the Italian words we needed slowly started seeping back into our brains, words like: bike, train station, hotel, left, right, straight ahead and a few numbers. Out on the streets the next day we were pleased to have enough Italian words to ask for directions and have successful encounters with hotel clerks about room information. We had forgotten the important little details like shop open-hours and the rules for tipping but still felt a welcome sense of ease in being back in Italy. Ah yes, and no more strategizing about the best moment to get a hot shower out of the Greek solar hot water systems that lack insulated or reserve tanks, in Italy it is generally hot water on demand. Spirits ran high on our first shopping spree in Italy: pull-top cans of ‘ceci’ beans (garbanzos) that we haven’t had for 2 months, ‘pollo allo spiedo’ (roasted whole chickens), our favorite flavorful mineral water for 45 cents for 1½ liter bottles (quart & a half), and a better selection of produce at the market. 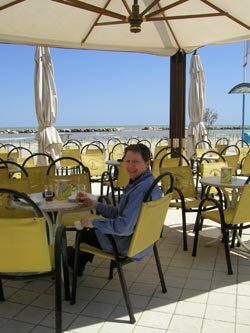 However, the “closed on Sunday and most of Monday” bookstore hours did get the better of us and we headed out of Ancona with barely usable maps rather than lingering another day--communicating and reading the signs in Italy was easy enough that we could risk it. Our first sightseeing stop on our way to the Alps was Urbino, in north-central Italy. Entering Urbino, a hilltop medieval-era walled city, was like having a textbook come to life around me. The just-wide-enough-for-a-cart streets were an immersion in brick: there was brick on 5 sides of us as we walked. Brick was used instead of cobblestones on the roadbed and brick was the primary construction material in most of the buildings. The steeply sloping, winding streets and sometimes “on tilt” buildings left me expecting to see brick overhead when I looked up. I gasped at the sight of all of this brick, realizing that these very bricks could well be from the revival of fired brick making that had been lost to the West since the fall of the Roman Empire. For close to 1000 years no one in the West knew how to make fired bricks. (Which as Bill pointed out, helps explain why so many marvelous ancient buildings were cannibalized for their building materials: people in the Dark Ages just didn’t know how to make bricks or hew great stones). Had we come to Urbino two weeks earlier THE BRICKS would have slid by me with a casual “Looks like they used a lot of brick here.” But by chance I had done a little time-travel in our electronic encyclopedia when I stumbling across a wonderful article on “Building Construction.” Fired bricks (vs sun-dried) were first used about 3000 bce in Mesopotamia and the Romans learned their skills from their civilized northern neighbors, the Etruscans. The Romans were avid builders and substituted brick for stone whenever possible as brick could be more cheaply mass produced. But this long legacy of brick making in the West came to an end with the disintegration of the western Roman Empire in the late 400’s. The Western world didn’t start making fired bricks again until the 1300’s and did so only when stone wasn’t available. For the Romans, brick was cheaper than stone but in the Middle Ages the cost of fuel for firing bricks made stone less expensive. Though I don’t know how early in the revival Urbino got its bricks, seeing these bricks so heavily used certainly drove home the importance of this technological rediscovery. And once they got going, the revival of ancient building technics didn’t stop with bricks and included stone and timbers as well. Parts of this encyclopedia article’s listing of construction milestones read like our travel itinerary with its references to the massive corbelled domes of the Mycenaean tombs we had just seen on the Peloponnese, the enameled fired bricks of the Babylonian Ishtar Gate (from 575 bce) which we saw in a Berlin museum, and the enormous concrete dome of the Roman Empire pantheon in Rome. What was disturbing however is that each of these architectural monuments represent key technological advancements—advancements that none of our tourist books highlighted at the given sites. It wasn’t until I happened across this seemingly buried article that my understanding of the significance of these projects moved beyond “Cool!” to a fuller appreciation of their place in history. We are constantly aghast at what a technological setback it was for the West when the advanced, ancient civilizations lost their grip on the world. Bill still references “the day the last piece of glass was made” when the Romans abandoned Trier, Germany—something we learned about during our first summer of travel. Predictably, we wondered if any of these mostly wooden machines were improvements over the state of the art in Roman times or if the West was still retrieving what had been lost. The last room featured more modern panels from the 18th century. It was weird to realize that these seemingly primitive machines were cutting edge while just a few years later in England the Industrial Revolution was getting under way. (And indeed, a few towns later another museum illustrated what a struggle is was for Italy to get on the band wagon of that Revolution.) Unfortunately, this technology time warp didn’t allow for any photo taking so we have no pictures to share with you or to jog our memories. 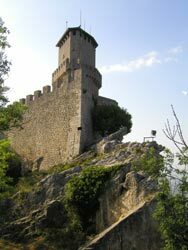 The Urbino region of our guide book said that San Marino is ‘a must see’ and that the road between it and Urbino was beautiful so we dutifully headed there. And indeed, the views from the hilly roads were stunning as we rolled up and down between the 500’ and 2000’ level. Vast panoramas and picture-postcard old villages and scenes nourished us as we climbed the many hills in the heat. Like the others of these first couple of days riding in Italy, the day had been delightfully green—a welcome change from the dryness of Greece. Here, all of the earth is layered with something green. Oddly shaped fields of cereal grasses conform to the steep terrain with stems topped with bulging grain kernels bending in unison in the breezes. Even the slopes that seemed to be 100% grade (45˚ slope) were being cultivated. At the convergence of steep slopes erosion reined and we’d see the rare swathes of exposed dirt, but unlike Greece, it was dirt and not rock. And that, we realized, was likely the reason for so much more green here: the underlayment doesn’t seem to be impervious, metamorphasized rock but something much softer, something that was easier for persistent plants to take root in. The green fields were often partially ringed by a row of deciduous trees and clumps of trees appeared on ridge tops and filled some ravines. Our orange-red poppy sightings went from dozens at a time in Greece to hundreds or thousands at a time as they seem to be planted in Italy rather than just being volunteers. Borders of vibrant poppies lined some roadways and so many poppies were intermingled with some grains that distance fields were squares of orange rather than green. A sure sign of the less rocky land is the complete absence of stone walls. In Croatia, Greece, and other parts of Italy the rockiness of the land is punctuated by the piles of rock, especially in the form of rock walls. Here, there was no rock: no interesting odd chunks used as finials atop entry posts, no rocks to hold down sections of roofing, no rocks heaped here and there or exposed with each land slide: “Nope, it just isn’t there”. Not surprisingly, with this more productive looking land, the homesteads and villages looked much more prosperous than the agricultural areas of Greece. 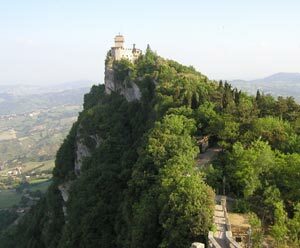 As we approached San Marino the landscape took on a fairy tale quality. 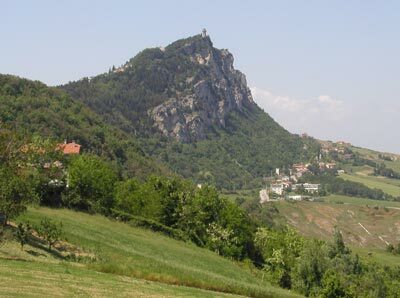 Mt Titano, upon which the original city/fortress sits, is the sole prominence of land that isn’t rounded but instead abruptly juts out into the sky with harsh angles and sheer faces like the bow of a ship in rough seas. In the distance we could make out a couple of crenellated towers completing the fairy tale look. The surrounding hills were all hundreds of feet lower and seemed to be a respectful distance back from Mt Titano. We arrived in the late afternoon and without locating the missing pages from our guide book so we didn’t know what to expect. All Bill remembered was that San Marino is a separate republic in the middle of Italy, kind of like The Vatican. But the flat affect, stone-faced shopkeepers and hotel clerks gave us the creeps—so un-Italian. Thank goodness for overlay created by the smiles and enthusiasm of the bus-loads of fellow tourists that gave the town some much needed life. It didn’t take long to assess that San Marino, the capital city of San Marino Republic, is an expensive town so we quickly snared a centrally located, 1 star hotel for $54. The large room was spare but clean and had a terrific view of the valley. Unfortunately, the single electrical outlet in the room was inconveniently placed inside the shower area. Undeterred, we rigged up a cooking platform in the shower only to discover that the outlet wouldn’t accept our European immersion heater plug or our northern Italy adaptor. So much for ‘eating in’ this night or recharging the laptop’s battery. And it turns out that the shower wasn’t much better suited for bathing than cooking. Though we have had plenty of showers with broadly spraying shower heads and no shower curtain, it was the first time to have that combination without an additional floor drain for the room. We could do nothing but watch the water puddle deeper and deeper in the tiny bathroom and then finally creep out into the sleeping room. It looked like they had sealed off the floor drain and made no other provisions for the water. I didn’t want to risk staining the skimpy bath towels by mopping the floor with them so we just splashed around in our ‘essential in European bathrooms’ rubber sandals being grateful it wasn’t our structural problem to deal with in a few years. While getting to know the idiosyncrasies of our hotel room and shaking off the zombie-like reception from the locals, we perused the pile of tourist literature from the unstaffed office. We quickly saw that San Marino is professionally ‘touristic.’ The brochure’s explanation of why one should visit was “Millions of holiday makers come every year because their friends have been there before them and liked it so much.” But “Why did they like it?” we kept wondering. Unfortunately, San Marino and its views of Italy suffered mightily from the thick veil of the pollution. The ocean was a mere 6 miles away and we couldn’t see it from our perch at over 2000’. We could discern the coastline by the abrupt edge of the seaside town’s buildings but couldn’t actually see the water. And the San Marino residents weren’t helping: in this intensely touristy town adjacent to one of the much visited old castle gates a homeowner was burning his just cut wet grass, sending up choking plumes of smoke over that part of town. Italian bikers on sleek machines and wearing the traditionally colorful biking costumes have appeared in our landscape. We look at these men (and it is almost exclusively men) charging around on the narrow roads clogged with traffic in this part of Italy that is constantly under a heavy blanket of pollution and wonder why they do it. There is no way I’d be a cyclist around these parts when every training ride means fighting to hold my own on the road and fighting for every breath. We presume that when the medical experts talk about air pollution alone resulting in lungs blackened with particulate matter like that of a heavy smoker that they are talking about air like in north-central Italy. This Po Valley region is notorious for its industrial pollution and it is hard to avoid. We presume we are getting a double-whammy with pollen allergies and pollution as much of each day here is spent with our eyes weeping and our noses running. Bill’s eyes suffer more than mine and we stop numerous times a day to restore his clear vision with antihistamine eye drops. And I have been lining up for my dose some days too as my eyes are becoming overwhelmed. Sometimes we have to pull off the road just to mop-up the flooding from our noses and eyes. We definitely aren’t alone as most anytime we scan the horizon we see other people dabbing their eyes and noses. And then there are our lungs. Mine are more vulnerable than Bill’s to sun-baked pollution—those higher temperatures put a toxic sting to the smog. More than once I’ve pulled off the road when the concentration of particulate materials from a belching uphill truck or an idling 2-wheeler has overwhelmed me. And we both quickly ditched early one afternoon on our way to Urbino when we simultaneously began gagging and choking, presumably on some especially potent exhaust. The crud in the air tightens up my lungs so it feels like the flats and the hills have an extra 5% grade added to them. Bill appreciated my obligatory slower pace on my worst day as it gave him more time to blot his stinging eyes. Whenever we stop to rest we redouble our efforts to get far off the road to reduce the concentration of the exhaust that we are swimming in, as every bit of distance helps. Map Man pours over the maps each night and selects routes and alternate routes that look like they will be uninviting to through traffic, especially the trucks. He has varying success in this intense industrial and agricultural part of Italy but he has managed to reduce and chop-up our time spent with trucks. Once that meant riding a few miles on a gravel road to link 2 routes and it often means being on rougher pavement and riding a few extra miles. Amazingly, we rarely see the Italian road riders on these bypasses and instead they are out there on the narrow truck routes, presumably so they can maintain the intensity of their training with higher speeds and fewer stops. But for us, the little bit cleaner air by far outweighs any thoughts of keeping our heart rates up. It is hard for me not to worry about the air quality improving quickly enough to allow me to do the hard climbing into the Alps. I remember from prior years’ approaches and from the bird’s eye view of an airplane seat that the pollution backs up against those imposing mountains. I don’t have distinctive memories of how quickly the air clears as we climb but trust I will somehow manage when we begin our ascent. We have been looping and zig-zagging our way through the Italian Dolomites hoping our boxes of camping gear will arrive at the Cortina hotel. The tardy boxes have substantially delayed our trip but the Dolomites are a terrific place to be ‘stuck’ while we wait. The only problem is that riding more than a few miles means grinding out several thousand feet of elevation gain up yet another pass. The scenic rewards are great but we are starting to take more rest days as the extra effort required by these steep, steep roads is taking its toll. Two of the three boxes of gear have finally arrived and have brought with them some new understanding. The first bit of insight was expanding (or correcting?) my associations with the expression “hanging by a thread.” I always assumed that it referred to the last strand of fabric-type threads but now it describes the nature of the attachment of our front pannier racks to the bike frames. Bill informs me that our front pannier racks are now literally hanging by a few less threads of the screws. The correct rack screws and spacers are in the missing box and he managed to buy some replacement parts that are almost as good as the originals. Here’s hoping that box shows up soon…. Our other edification that resulted from 2 of our 3 boxes arriving is a better understanding of what awaits (or doesn’t await) us in Hungary. Hungary is on our itinerary this year to meet my need to see Budapest and Bill tucked a hard-to-find Hungary guide book into our boxes. In looking at the especially thin edition he noticed the conspicuously unremarkable comments about the sights to see. The traditional 2-page map at the front of the Lonely Planet books that always whet our appetites with wonderful sounding ‘must-sees’ falls short for Hungary. One of the more specific highlighted items reads: “The views of Lake Balaton from the hills here are the best in central Transdanubia.” And the “Suggested Itineraries” that normally start with 1 week and end with 2 months for some other countries starts with a 2 day visit and ends with 2 weeks for Hungary. But people rave about Budapest and we’ll see for ourselves what the rest of Hungary has to offer after we make a few stops in Austria and perhaps Slovenia.